KUCHING: Sarawak’s housing industry is in for a big change as the state government is currently in talks to amend the Strata Title Ordinance and introduce a new law concerning strata titles by this year. Chief Minister Datuk Amar Abang Johari Tun Openg, in revealing this, said the current strata title law, which is under the State Land Code Management Corporation, was not stringent enough, particularly in today’s housing industry scenario. “Right now, we don’t have a law that can control the development of ‘Small Office Home Office’ (Soho) and when there is no law or ordinance for this, how are we going to determine if it is residential or commercial?” he told a press conference after officiating the Taman Sri Maya Housing Project at Pasir Pandak near here yesterday. He cited Vivacity as an example of development that comprises a residential section as well as a shopping mall. “There is a difference between residential and commercial licence but when the development is combined just like Vivacity, how does the law for this come in? Hence, the reason why we need to introduce a new law in terms of strata titles in order to manage all the new housing schemes in the housing industry,” explained the Housing and Urbanisation Minister. On when this new law will be introduced, Abang Johari disclosed that the State Attorney-General (AG) was still studying the revision of the Strata Title Ordinance. “Hopefully, the Ordinance should be amended by this year after the AG has completed the further study and upon cabinet approval, we will table this at the State Legislative Assembly (DUN).” Earlier in his speech, Abang Johari gave his assurance that the state government was looking into the best possible approach to help prospective homebuyers in the state. “We have a lot of land but the price of the houses here is increasing. Of course, we have to take into consideration inflation but the increase cannot be around 40 per cent to 60 per cent. “This has resulted in even our graduates finding it difficult to purchase a house even with a combined income of RM6,000, for instance. It is not easy for them to buy a house that costs RM350,000 because they have other commitments such as their car loan, mobile phone bills, Astro bill and so on,” he said. In view of this, he stressed that the state government would continue to find the best way that could benefit both the purchaser as well as the developer. 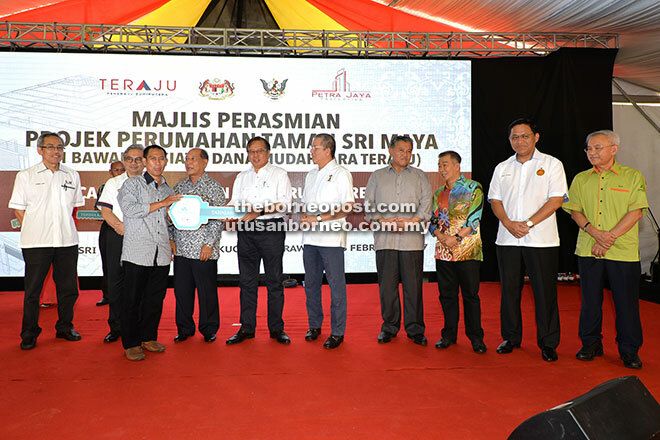 During the ceremony, Abang Johari handed over replica keys to purchasers of Taman Sri Maya housing units. Located on 18 acres of green field area, Taman Sri Maya comprises 120 units of single-storey semi-detached and detached houses with selling price per unit ranging between RM280,000 and RM650,000. The RM25.5-million Bumiputera housing project was led by local Bumiputera property developer Petra Jaya Properties Sdn Bhd, which is one of 430 companies selected by Unit Peneraju Agenda Bumiputera (Teraju) to receive the Facilitation Fund assistance. For Taman Sri Maya housing project, Petra Jaya Properties was awarded assistance of RM3.2 million to be used to facilitate overall construction cost. Present were Works Minister Datuk Seri Fadillah Yusof, State Secretary Tan Sri Datuk Amar Morshidi Abdul Ghani, Assistant Minister of Resource Planning Datuk Naroden Majais, Assistant Minister of Urbanisation Datuk Talib Zulpilip, Assistant Minister of Public Utilities (Electricity and Telecommunications) Dr Abdul Rahman Junaidi, Petra Jaya Properties chairman Tan Sri Datuk Amar Hamid Bugo and Teraju chief executive officer Datuk Husni Salleh.